We designed these as an intermediate arm length (something in between our other arm lengths) for those not wanting the full extra width to something in between. We also had in mind cost and weight. We wanted an arm that was affordable. So we designed these with that in mind. We opted for an extension coupling on the upper arms. By doing this we eliminated the need for an additional aluminum arm, which saves on weight and cost. The coupling was designed for strength with no loss in durability. You will actually see the rear upper arm coupling will make it 10x stronger than the stock setup. 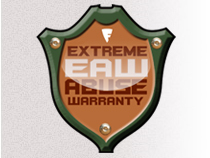 We have also maintained our lifetime warranty. Why? Because we believe this is the best product available. That is why we stand behind it.